TRANSPORTATION round trip by bus from the Lobby of your Hotel or meeting point. Entrance to the Ruins of CHICHEN ITZÁ. 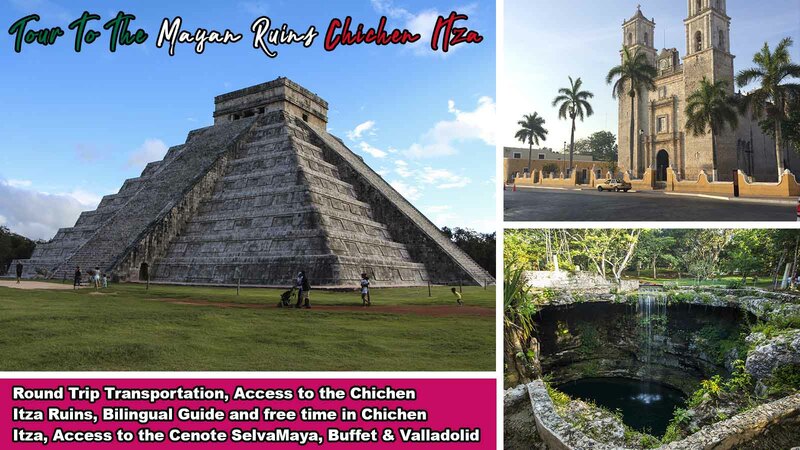 Bilingual guide FREE TIME IN CHICHEN ITZÁ for photos and walking on your own. Entry into CENOTE MAYA, time to swim. Brief tour of the Magic Town of VALLADOLID (15-20 minutes). Bring swimsuit, towel and extra clothing. Cash (last minute purchases, souvenirs, sodas, snacks). Infants are considered less than 0 to 3 years old. Infants must be seated in parents legs for safety. Access to camera recorders is $ 150.00 MXN (may vary), payable directly at Chichen Itzá. Tripod access for cameras is not allowed. Lets go The Equinox Adventure is in Chichen Itza!. $ 59.00 Juniors 3 - 9 Years. Free, Infants under 0 - 3 Years. Discount valid price by booking online.